Swing Trading - What Does It Mean? 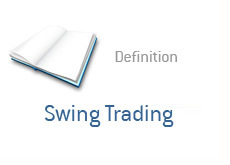 What is the definition of "swing trading"? In order to understand what "swing trading" is, let's first look at two other types of trading. Day trading is when you buy and sell a stock in the same day - many daytraders are looking to get in and out of a stock in just a couple of minutes. Daytraders will usually never hold a stock overnight. Long-term investing is when you buy or short a stock and have every intention of holding on to your position over the long term. "Swing trading" could best be described as being somewhere between daytrading and long-term investing. A swing trader is usually looking to hold a stock for up to a week, depending on how their position performs. Swing traders have no problem holding a stock overnight, but they also have no problem selling a stock within a few hours (or even minutes). Swing traders have the flexibility of a daytrader and the patience of a long-term investor. XYZ surprises the Street by posting much stronger than expected earnings. There is a very large short position in XYZ. A swing trader buys XYZ, determining that the stock is about to break out. This trader has no problem holding XYZ for a week, as he believes that the stock will turn in substantial gains over that time. That being said - if the rally quickly dies, the swing trader has no problem selling the stock and moving on. A stock in the banking sector is breaking down and ends up crashing through its 52 week low. A swing trader surmises that the stock will continue to trade lower, so he decides to short 1,000 shares at $9.50. He believes that the stock will significantly break down over the coming days, but he also has in a tight trailing stop just in case there is a quick, short-term turnaround in the sector.